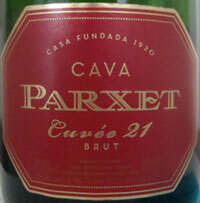 Parxet has been making Cava in the Alella region north of Barcelona since 1920. Cava is Spanish Sparkling Wine. They have approximately 200 hectares on vineyards in generally nutrient poor soil with low water retention. The soil is granite based, and grass is grown between rows of vines, forcing the roots of the wines to grow deeper and helping to minimize erosion. The Parxet family of wineries includes wineries in other regions of Spain as well, including Ribera del Duero and Rioja, but here we'll only discuss their Cava. The primary grape grown is Xarel·lo (locally known as Pansa Blanca) as well as Macabeu and Parellada. Pinot Noir and Chardonnay have been introduced fairly recently as most Cava producers have. In general, I prefer the traditional varieties for Cava but remain open minded about it. They make two sets of Cavas. The Titiana range includes the Titiana Pansa Blanca Brut (90% Pansa Blanca, also known as Xarel·lo), Titiana Rose (100% Pinot Noir), and Titiana Vintage Brut Nature (80-90% Chardonnay depending on the year, and with no added sugar). These appear to only be available in Spain. Brut Riserva - Traditional grape varieties of Macabeo, Parellada, Pansa Blanca. Brut - Slightly sweeter than the Brut Riserva. Brut Nature - No added sugar or dosage. Reserva Semi Seco - A Semi-sweet version. Cuvee Desert Dolc - 100% Pinot Noir and sweet, available only in 1/2 bottles. Parxet Maria Cabané Gran Reserva - A vintage wine aged at least 3 years before release. Parxet Aniversario Brut Nature - An International style which is fruity and floral and big and structured with some fermentation in French oak barrels. Only a small amount is made each year. They started making this to celebrate their 75 anniversary, and do not disclose the grapes used (although the "International Style" is a tip off that it is not 100% traditional grapes). The nose has a little apple and a little minerals. The palate is similar. It's simple yet pleasant. Very simple and pleasant. That's all she wrote. Not a lot here, but happy to drink this. Looking at notes online, there are enormous variations in ratings so there may be some big bottle variation or bottle storage issues.